The home moving process is an extremely busy period that will test your organization skills and ability to work under pressure. Fortunately, you’ll have a good moving checklist that will keep you organized by reminding you what you’re currently working on, more importantly, which task is next in line. However, you’re going to need another type of checklist – a home inventory checklist that will detail all your household items in a clear and systematic manner. A home inventory list can be extremely helpful in a number of circumstances, including after the mover is over, but its true power comes right before you start packing for a move. Read on to learn how to make a moving inventory list when moving. A home inventory lists the contents of your home, room by room, item by item. In its essence, it is a detailed record of all your household items with a bit of essential information about each one – description, current condition, make and model, cost at the time of purchase and estimated value at the moment. Creating a home inventory when moving is one of the smartest things you can do when moving house and you should do it regardless of whether you’re taking your things straight to the new home or putting them into temporary storage. There are numerous benefits to having that home inventory checklist with you throughout the residential move. In reality, it takes time to conduct a household inventory properly and you may be wondering why you should make your move even more complicated and stressful than it already is. While you’re going to have to spare time to document everything you own prior to packing, the truth is that the extra work and efforts you’ll invest now will pay off handsomely when it’s time to unpack your things. Furthermore, a moving inventory list will come in handy in case you’re forced to file an insurance claim with your mover for damaged or missing items. Here are the top 6 reasons why you should definitely take the time to take inventory of your home before moving out. The best way to have your moving cost estimated is to ask professionals to visit your home in person. The next best way to get an accurate price quote is to send a detailed home inventory list to your movers. When you’re moving across the country, the cost of your long distance move will be calculated based on the number and total weight of the items you have for moving. This is the main reason why the best professional movers in the business insist on visiting your home in person – they do it because they want to give more accurate moving quotes. So, when you already have a detailed home inventory list of all your belongings, you may choose to send that list to several top-rated moving companies in your area so that you can get accurate cost estimates more quickly and easily, without having to have moving experts visit your home for visual inspections. Packing and moving absolutely everything you own without sorting out your stuff is a bad idea no matter how you look at it. Don’t make the mistake of moving items that you won’t ever need again after the move – if you do, you’ll surely lose TIME to pack those unwanted things, lose MONEY to transport them, and lose SPACE to store them in the new residence. Doing a home inventory will enable you to identify all the household items that are not worth packing and moving. Declutter your home before moving with the help of a detailed home inventory list – sell, gift, donate or recycle your useless belongings. Your home inventory checklist for moving will help you narrow down the high-value items you intend to move with you so that you can purchase an additional coverage for those valuables. You’ll only get Basic Limited Liability Protection when you sign the moving contract with your mover, and the major problem with that basic coverage is that, valued at 60 cents per pound per item, it is practically zero. Discuss your insurance options with your moving company once you have your home inventory list ready. Make sure your valuable items are adequately insured simply because anything can happen during a home move. Believe it or not, your home inventory list can be used effectively as a packing list as well. A well-made packing list will help you keep track of all your items during the entire packing process and will make it almost impossible for you to forget to pack and move an important item. The best thing about using your moving inventory sheet as a packing list is that it’ll simplify both the packing and unpacking processes because you’ll know exactly what goes where in both instances. And, mind you, using efficient time-saving techniques during the most time-consuming task in your moving checklist is always welcome. Do NOT sign any documents until you’re sure that all your moving boxes have been delivered. The detailed record of everything you’re moving will help you protect your possessions. How? If an item gets damaged while it’s being moved between the two homes, or if it somehow goes missing, you’ll have a home inventory list that can provide detailed information about exactly what that damaged or missing item was and how much it was worth. This is especially important if you have no other choice but to file an insurance claim with your moving company. After your things have been delivered, it’s your responsibility to check each one against your home inventory checklist. Don’t sign the moving waybill until you are absolutely sure that everything is accounted for. Sometimes there are problems and you’ll need to respond quickly and adequately to them. To claim insurance reimbursement with your mover, you’ll need to have an itemized list of all items that you moved between the two homes. And it’s that inventory sheet that will enable you to speed up the insurance claim filing process. Now that you know WHY you need to create a home inventory list, let’s say a few words about WHEN to inventory all the items in your current home. Logically speaking, you should create a home inventory sheet as soon as you’ve decided to move and definitely before you start packing for a move simply because that sheet will also serve you as a packing list. It makes a lot of sense to inventory your stuff before packing it up because the itemized list will help you re-evaluate your possessions in hopes of reducing their number, which in turn will cut down your packing and moving costs too. Important note: if you’ve decided to hire professional packers, they will create the home inventory sheet as they’re wrapping and boxing your things. Despite this, it’s recommended that you still create your own home inventory that’s independent of the one created by the pros. By now you should be utterly convinced in the clear advantages of preparing a house inventory sheet when moving from one home to another. You also know that you are expected to inventory your household items as soon as possible and clearly before initiating the packing task. And having solved the WHY and WHEN puzzles, now it’s time to provide the answer to the most crucial questions of them all: HOW to make an inventory sheet during a house move. 2) the modern digital-era inventory method of using a software program on a computer, tablet or smartphone. Of course, creating a digital inventory has a number of advantages over the standard pen-and-paper technique – those versions can be easily edited and quickly saved. 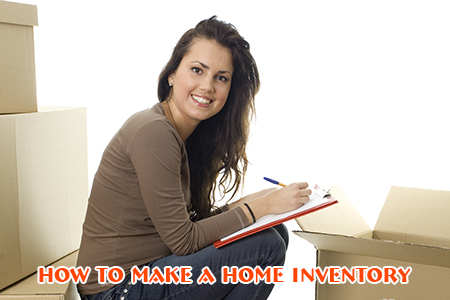 But more importantly, home inventory spreadsheets and inventory templates are readily available on the Internet, which can make the entire itemizing and cataloging process much more efficient. In the end, it won’t matter much which home inventorying method you use – just pick the one you’re most comfortable with to get the job done as quickly as possible. Creating a detailed household inventory list for moving sounds like a lot of work, and it is. Thankfully, there are specific tricks to speed up the entire process so that you don’t lose days trying to catalog each and every book you own, for example. A digital home inventory is faster to create, easier to edit, and more convenient to share. You can’t afford to lose too much time with that task simply because there are so many other equally important jobs to take care of as well. Remember? For maximum efficiency, inventory your house or apartment one room at a time. The concept is simple enough – you go into your living room and catalog all the items in it. Then, when finished, you move on to another room and create a separate inventory sheet. In other words, each room should have its own inventory list of the items found in it. As mentioned earlier, you don’t need to inventory individual items such as books, pieces of clothing and so on. However, you do need to catalog individual high-value items (monetary or sentimental). The moment you enter a room with the purpose of inventorying its contents, start the cataloging task with the largest items in that very room – furniture pieces, household appliances, electronic units and so on. Once you’re done with them, keep inventorying the smaller items until you’ve itemized everything in the room. Item description. Be as specific as possible and provide, whenever possible, relevant info such as the model, manufacturer and even serial number. Current condition. Try to be objective and describe any existing damage to the item. Value. Note down the original price and attach any receipts you keep as proof. Also, write down the approximate current value of the item to establish your movers’ liability in case of damage or loss. Destination room. Mark the destination room in the new home – this will facilitate and speed up the unpacking task. Notes. Write down any additional information that may prove useful during and after the move itself. Yes, it’s the digital camera. Your moving inventory list will be complete only when you add visuals to it – that is, photos. 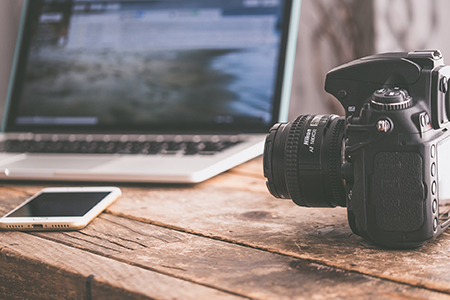 In reality, it’s really important that you use a digital camera to take plenty of photos of your inventoried items, including kitchen items, pieces of clothing and garage tools. Let the house inventory begin! Make sure you end up with high-resolution clear photos from various angles that can serve as proof of your items’ current condition – especially crucial when it comes to your valuables such as artwork pieces, jewelry pieces, electronics, collector’s items and other treasures. If possible, turn on the date-stamp function of your digital camera too to remove any doubts about when those photos were taken. Also, you can choose to do a video home inventory using a dedicated video camera or simply your smartphone’s camera. Making a video recording of your belongings is the easiest and fastest way to make a home inventory when moving. Get someone to help you out by walking around your home with you and opening the doors and drawers for you, or holding up the smaller items so that you can record them better. Feel free to add audio notes (commentary) with relevant information as you’re filming your household items. Important: Keep in mind that adding visual records of your possessions is only supposed to supplement (improve) your written home inventory list, and not to replace it. Performing a standard home inventory (hand-written inventory sheets) can take too much time, time you may not be able to afford during your preparation, especially if you feel like you’ve fallen behind on your moving checklist or if you’re trying to pull off a last-minute move. In such cases, it’s best to bet on specialized home inventory software that will complete the task much easier and much faster than you could ever do it by hand. The good news is that the best home inventory apps on the market today have ultramodern house inventory tools that will enable you to create a virtual inventory map of all the belongings in your home within minutes.